The Ewing English Society held its second and final round of ‘Spellathon’ on 25 October 2016. The enthusiasm of the participants and the host team went up a notch on the second day of this combative competition. From participants to the audience, everyone was highly engrossed in how the spelling game will unfold and who will come out as the victor. Interesting twists, surprise rounds and musical performances kept the spirits high. Bonus rounds were introduced where the audience asked the participants to spell out the words of their choice. The audience, not being a disappointment at all, asked the most mind-boggling and thought-provoking words. The audience was also given a chance to spell out a word correctly and win a certificate of appreciation. Mr Iqran bin Arshad was the lucky student who won this certificate. A musical performance by the members of Ewing Society was executed beautifully by Sharoon Anthony, Shariyar and Abishae Noel. However, the best part of this entertainment session was the mesmerizing performance of Mr Umer Shareef, a staff member of our university. He captivated everyone with his amazing voice. 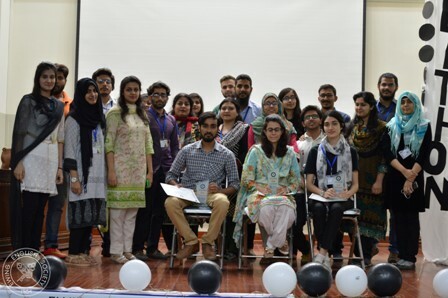 Our esteemed panel of judges for the second day included Assistant Professor, Rehana John; Ms Rabia Wasif and Sir Muhammad Abdullah. We are thankful to these honorable guests for giving us their precious time and sharing their expertise. We are also thankful to the Advisor of The Ewing English Society, Jacqoline J Austin for her presence for both the days of the event. 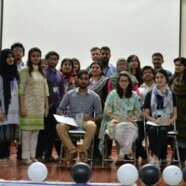 All the students are grateful to all the Jury members from English department. 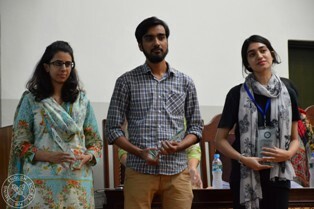 After two exhaustive rounds, Talha bin Tariq secured the third position, Shahrukh Burki bagged the runners up title while Zeeshan Fatima named the day after her by winning the competition. It was a privilege for the Ewing English Society’s council to share the stage with such talented participants and guests for one last photograph before we said goodbye to ‘Spellathon’ 2016.